Before Lincoln Michel’s confident and inventive debut story collection, Upright Beasts, even properly begins, we’re cued into its darkness, weirdness, and spirited sense of play. “To the abyss,” Michel writes in his dedication. “Thanks for always staring back.” The dedication sets a tone that underlies many of the book’s stories, especially some of the earliest stories like “Our Education” and “Almost Recess,” which do especially fine jobs of capturing the wilderness, chaos, and whimsy of childhood and school. But it also signals Michel’s tendencies as a prose stylist, one who like the poet Ronald Johnson “composes holes,” working best in fragments and ellipses, summoning stories up from the white abyss of the page. 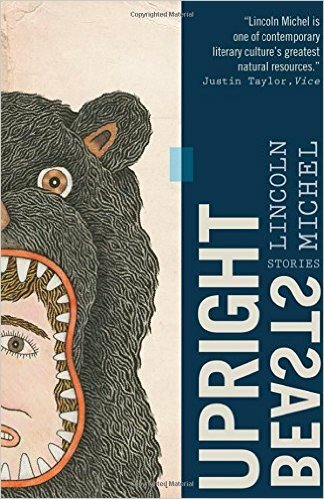 Perhaps readers of Barthelme will be reminded here of another other famous dictum, “Fragments are the only form I trust.” Indeed throughout this collection Michel displays a Barthelmeian penchant for the absurd and a wicked dry sense of humor. Other reviewers have noted the Barthelme comparison in slightly more disparaging ways. But so what? I wish more writers (and their publishers) were as brave and entertaining and strange. And once this collection gets going, such surface level comparisons fall away. 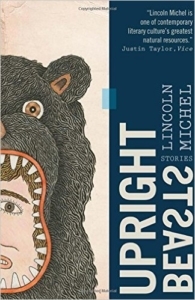 Upright Beasts is an immersive and original book, and Michel’s stories often have a “one more bite” quality. They’re swift, fun to read, and urge readers to compulsively turn the page. But then Michel has already established himself as an expert in the very short story. As editor of Gigantic, a magazine that limits story length to 1,000 words, he’s spent his early career championing the possibility and versatility of the form. In Upright Beasts he doesn’t hold himself to quite the same strict word count, but his stories don’t often go on for more than five or six pages and they are all wildly varied and pack a compact punch. In its way this sums up the central struggle of many of Michel’s characters: What do we do about getting old? Michel’s characters are usually more concerned about aging into adulthood than dying outright, about taking on new and more burdensome responsibilities, leaving behind childish things. In another standout story, “Halfway to Somewhere Else,” a man takes his wife and newborn daughter to a swimming hole that he used to enjoy as a child only to allow himself to be drawn into a brief and violent altercation with local teens. This story is told in a more naturalistic vein than many of the others in Upright Beasts, which includes in total a generous twenty-six. But even here Michel is attuned to the peculiarities of language, the way that a striking image or strange turn of phrase can mine weirdness from the most mundane. It was one of those sunny days where the sun licked you all over like a stray dog. The kind of day that wore on you. All you wanted was some lemonade, but the little boys and girls were inside with the TV and the AC, and the paper cups were being chewed apart by rats. Because Michel pays careful attention to language — he writes fine, taut sentences that accumulate with admirable rhythm and pace — he gains a lot of confidence from me as a reader. I’m willing to follow him when his stories move in strange directions or when he experiments with genre, challenging the divide between so called “literary” fiction and “not.” In fact it’s when Michel engages most directly with genre fiction, when his imagination feels least restrained, that I found myself most engaged. He writes with fannish enthusiasm and insider knowledge, with enough humor, emotional awareness, and self-consciousness about tropes and clichés that stories that take on otherwise familiar material (zombies, aliens, clones, or the second president John Adams) feel fresh. In part it’s because Michel is always aware of the darkness at the heart of his fantasy, and this darkness helps him reinvent. In “What We Have Surmised about the John Adams Incarnation,” for example, post-apocalyptic archeologists reimagine the second president as some kind of tyrannical god-king. When he looked on what he had wrought, John Adams is said to have let out a month-long howl from the sacred House in White, a scream so terrible in force it rendered an entire generation deaf and ripped apart the very earth, forming the great canyon of the western desert, a fissure the Adams incarnation disappeared into only to reemerge later as the kindly Jefferson form. The collection closes with two long stories that play explicitly with genre (although I should inform you that Michel sneaks in one more story after the credits in a move that’s unexpected, filmic, and fun). The first, “Dark Air,” is a science fiction-horror mashup with a madcap plot that pleasantly recalls the movie Slither, one of my favorites of the mid-aughts. There’s a weekend trip to the country, a car crash, cultish “hillbilly hippies,” and the mysterious creature they keep in a box. It’s all fairly silly stuff and Michel handles it with humor and a light touch. But the story really rises to the next level when Michel is most in control of contrast and tone. There are moments when the dark reality of the situation doesn’t line up with the story’s easy language, and we realize that like the narrator we’ve been led into a trap. Despite the glee that the story takes in the antic and the absurd, we find ourselves in deeper emotional territory than we initially expected to be in, and in the end are rattled and moved by the story’s unexpected grace. The next and final story in the collection doesn’t hit quite as hard. “Getting There Nonetheless” is a zombie story, as numinous nowadays as zombies themselves (I myself am guilty of having written one). Two young couples are trapped on a farm while zombies ravage the countryside around them. One of the young couples is expecting a child and the other, trapped in a kind of shambling and eternally adolescent relationship, is not. As with all of Michel’s stories, the prose is crisp and engaging, the premise entertaining and fun. But I think the zombie metaphor is a bit too on the nose (and in saying this acknowledge that I, the pot, am calling the kettle black), and the material doesn’t transcend its conception in quite the same way as “Dark Air.” The story is weakened by the close proximity, and in a collection so varied and rich I can’t help but wonder if it would have affected me more had it been placed somewhere else. But Michel’s stories hit hard much more often than they don’t and the collection surely marks the arrival of an exciting new voice. For all the concerns his characters have about aging — moving from the relative sociopathy of childhood into “responsible” adulthood, or facing up to the reality that time, the beast, will swallow us all — the theme itself is eternal and worth the sustained attention that it receives here. Getting old is profoundly weird, oftentimes unsettling, and always absurd. It is also, alas, as unavoidable as zombies. And so Michel’s mixture of pop-culture and darker, more surreal dramas provides an appropriately familiar, complex, and chaotic canvas for this important and universal conflict to play out. Bryan Hurt is the author of Everyone Wants to Be Ambassador to France (Starcherone) and editor of Watchlist: 32 Stories by Persons of Interest (OR Books/Catapult). His fiction and essays have appeared in The American Reader, Guernica, the Kenyon Review, the Los Angeles Review of Books, Recommended Reading, and many others. He teaches creative writing at St. Lawrence University.